1987-1996. Due to the protected status of Denne Hill, the building had limited possibilities, as regards to a licence for film and entertainment, as well as the sale of alcohol and food. Learning of the Culture and Tourism policy of the city of Bradford, and the surfeit of impressive historic buildings in Bradford`s city centre, I decided to move North to the city which at the time was very effectively “Bouncing Back”. 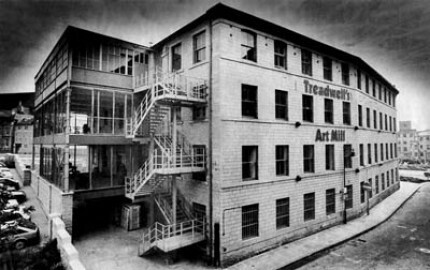 With the aim of creating an Arts Attraction, having equal value for local Culture, Tourism and Education, the Art Mill was my “Idealistic Dream”. I had made a substantial profit from the sale of Denne Hill, and was able to purchase the 3,300 square metre former wool mill in the city`s Little Germany area, adjoining the city centre. In order to get things absolutely right, I spent three months living in the building, while I planned it`s lay-out. The restoration took two years and we opened to the public in 1989. The Art Mill`s facilities included a temporary exhibition floor, a floor for the permanent collection, 120 seat theatre, 77 seat cinema, cabaret bar with stage, vegetarian cafe and 14 artist studios. It had considerable success as an educational resource, with regular visits from schools within a two hour radius of the city. Bradford was also the home of the National Photographic Museum, and many visitors visited the Art Mill in the morning and the Photographic Museum in the afternoon, or vice-versa. It had 22,000 visitors in its second year, and as an example of Regeneration through Culture, was officially visited by Prince Charles in 1990.